The Liturgy of this fifth week of Lent is filled with lots of drama both in the Old Testament and the New Testament. In the course of this week, we have the powerful stories about the accusation against Susanna, a healing image lifted up in the desert, the three faithful witnesses who survive the fiery furnace and today the account of God's covenant with Abram. Each of these readings is matched with the gospel from John. We hear about witnesses and testimony and judgment, about Christ being lifted up (on the cross and in glory), about the freedom/liberation He has come to bring, about Himself as the fulfilment of God's covenant, the new and everlasting covenant. And, we can feel the opposition rising against Him. All these stories and dramas that dotted the readings of this week are pointing to Our Lord Jesus Christ who came to give us life and reconciles us to God. In the open confrontation and heated argument between Christ and the Jews in the gospel of today, Christ made it clear that He came not to seek for His own glory but the glory of the Father. To do not His own work but the work given to Him by the Father. The Period of Lent is a time the Church calls us to focus to seek the glory of God in whatever we do not for our own glory. One of the signs that shows that we know God is by keeping His commandments. Another sign to show how we love Him is by being faithful to His word as Christ emphasizes in the gospel of today. Let us not be like the Jews who listened directly to the words of Christ, saw directly all the signs and wonders, miracles He performed yet they hardened themselves to believe in Him. Christ has given us all that will help us to be rest assured that He has a thought of life for us, not death. 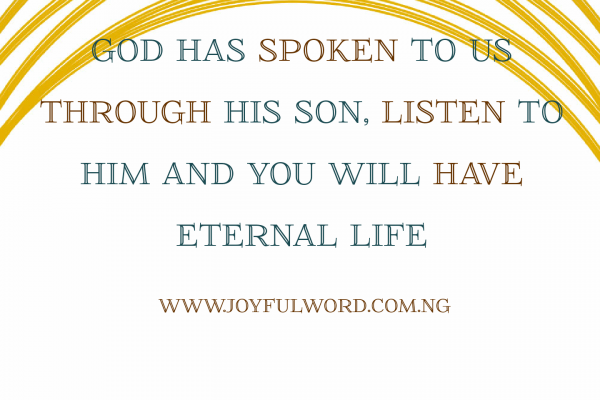 Let us then listen to Him and live. Let Us Pray: Lord Jesus, give me grace to believe in you and to trust in you and to believe in your words always. May my heart be open to whatever you reveal to me. Amen.